processed image of micro droplets, with detected circles drawn on it. The microfluidics is the science and technology of systems that process or manipulate small amounts of fluids, using channels with dimensions of tens to hundreds of micrometers. Since a decade microfluidics has become a powerful tool for fundamental and applied researches. Microfluidics influence subject areas from chemical synthesis and biological analysis to optics and information technology. At CEA / LIONS, we integrate microfluidics technology in several research projects. The present work deals with the development of tools for the detection and the analysis of complex calibrated micro-drops. 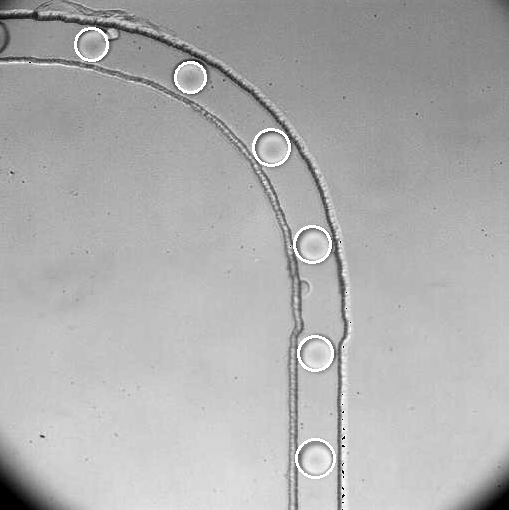 Although this technique uses small volume of chemicals, it requires the use of numbers of accurate electronic equipments such as motorized syringes, valve, pressure sensors and video cameras with fast frame rate coupled to microscopes. We use a TANGO control system for all these heterogeneous equipments in microfluidics experiments and video acquisition. We have developed a set of device servers which allow image acquisition and droplets detection (size, number, velocity) almost in real time.